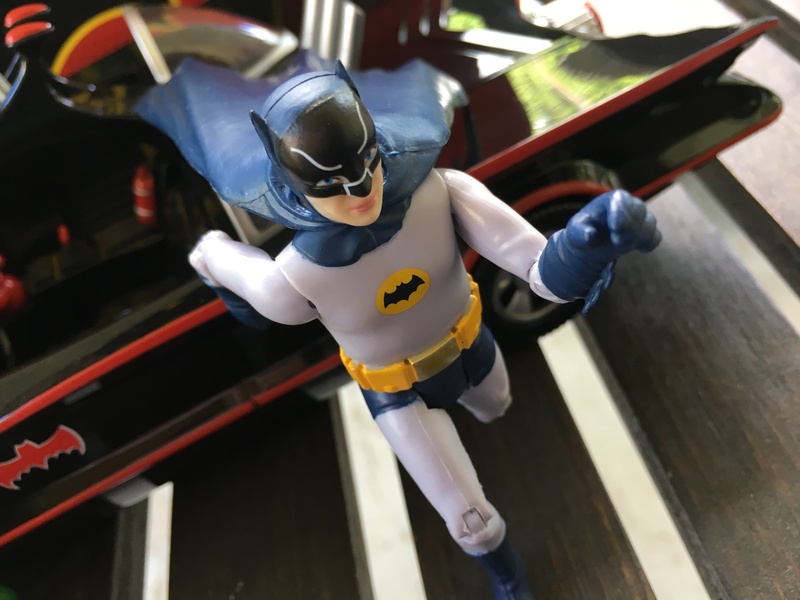 13 QUICK THOUGHTS: Does it deserve a spot in your Batcave? Oh, yes. 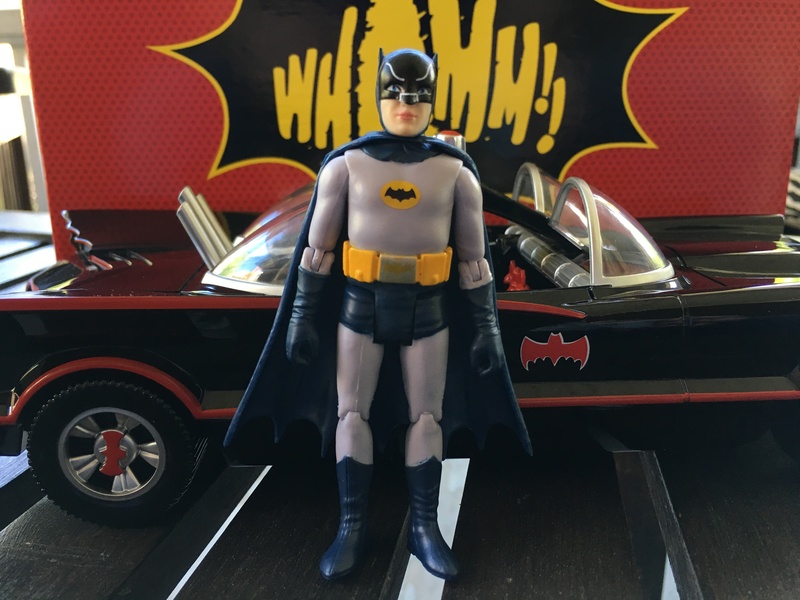 So we’ve written an atomic pile’s worth of stories already on Funko’s new Batman ’66 3.75-inch line. (Click here.) 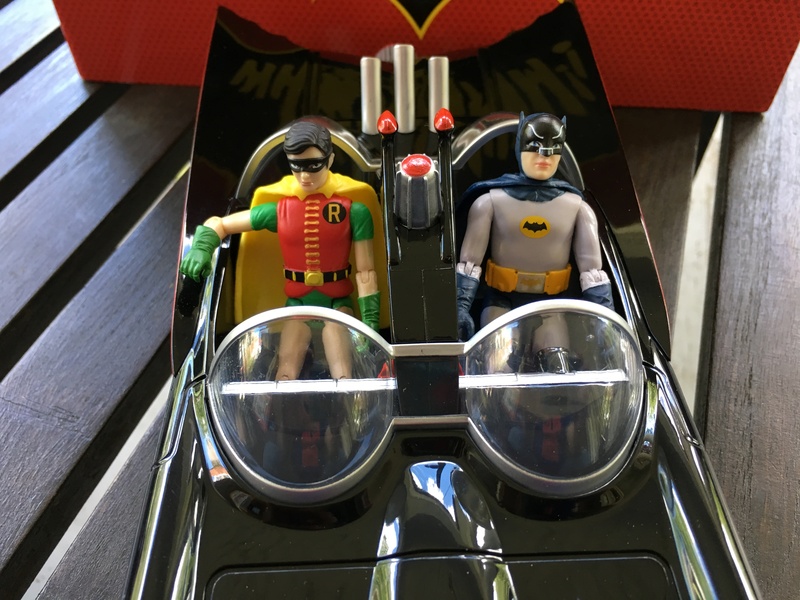 But now that the first item is out — the Batmobile with Batman and Robin — it’s time to take a look at whether it’s right for you. 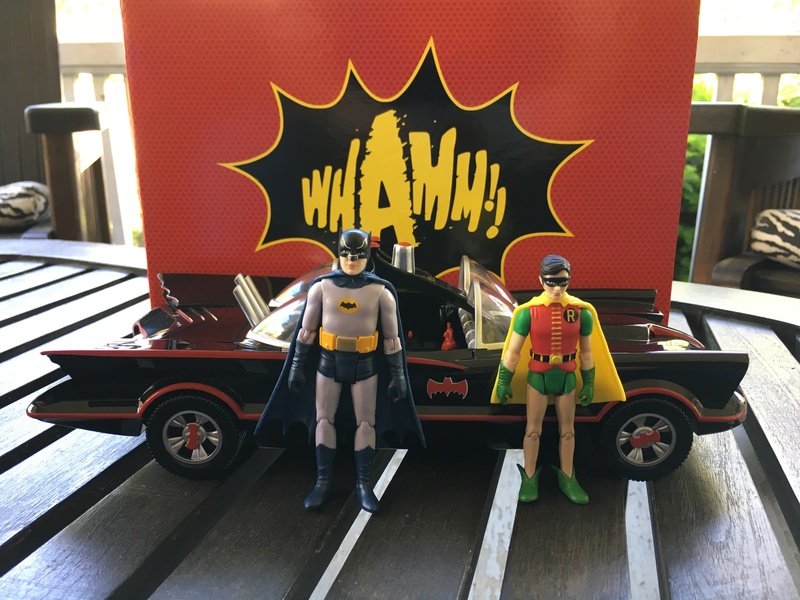 Now, before I even get started, it’s worth repeating that I think this has the chance to be the definitive Batman ’66 action-figure line, given Funko’s desire to go further than other companies in terms of pulling out obscure and interesting variants that add substantial value to the line and don’t feel like money grabs. So I’m already inclined to like what I see. I really want this line to succeed because I really dig everything about it. I’m also not the kind of guy to write product reviews of things I don’t like. Life’s too short, y’know? But there are always quibbles, and I’ll point some of them out along the way. 1. The Great: That this exists. As I just noted, I’m incredibly excited by this line. 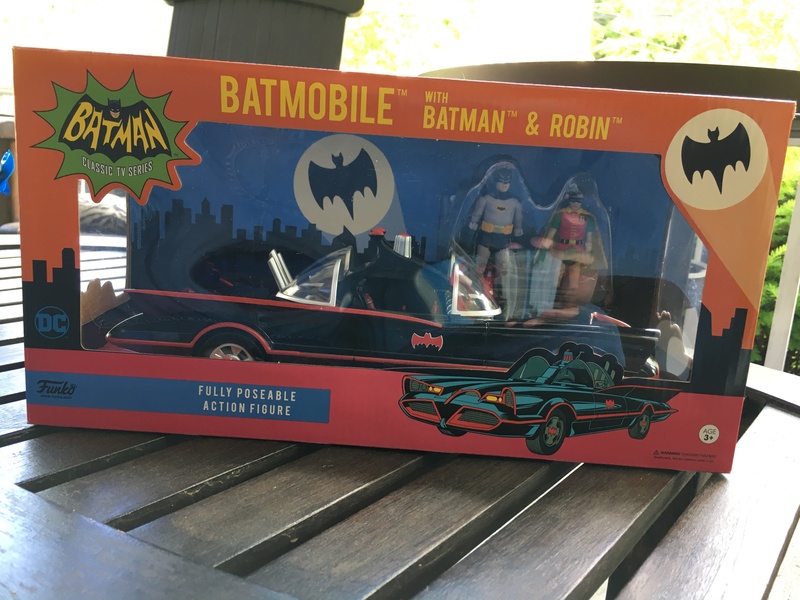 Keeping this to the Batmobile set itself, Funko’s done a great job of capturing the likenesses while also making it clear that these are toys. You don’t have to put on white gloves to hold these and pose these and roll the Batmobile around. 2. The Good: The Batmobile looks terrific even if it has to take some shortcuts with its various accoutrements. It’s shiny and solid. 3. The Quibble: The Batmobile is too short. But so what? Funko made the choice to tighten the dimensions for a variety of reasons — affordability and shelf space among them. Would I have preferred the dimensions to be show accurate? Of course. But my all-time favorite toy Batmobile — the Mego Batmobile — is way off scale, so who am I to complain? 4. The Great: At the same time, check out the detail on the Batphone. Where Funko decided to get into the nitty gritty, they really succeeded. 5. The Great: The front and rear. Outstanding. 6. The Great: Batman himself. Some readers have beefed that his body is a little too stocky. I find it refreshing. 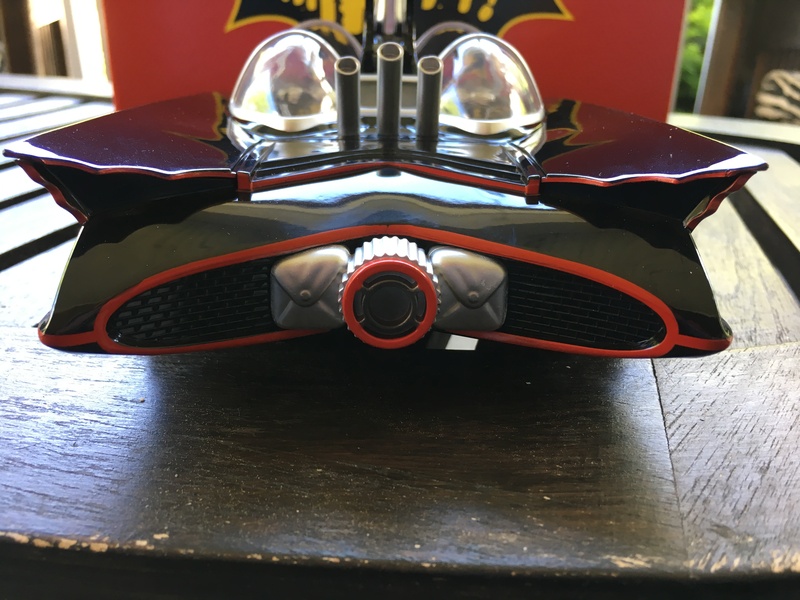 That’s closer to Adam West’s build than many other Bat-items we’ve seen over the last few years. The color scheme is right on and I love that the Batsymbol is centered in his abdomen, where it was so often on the show. 7. 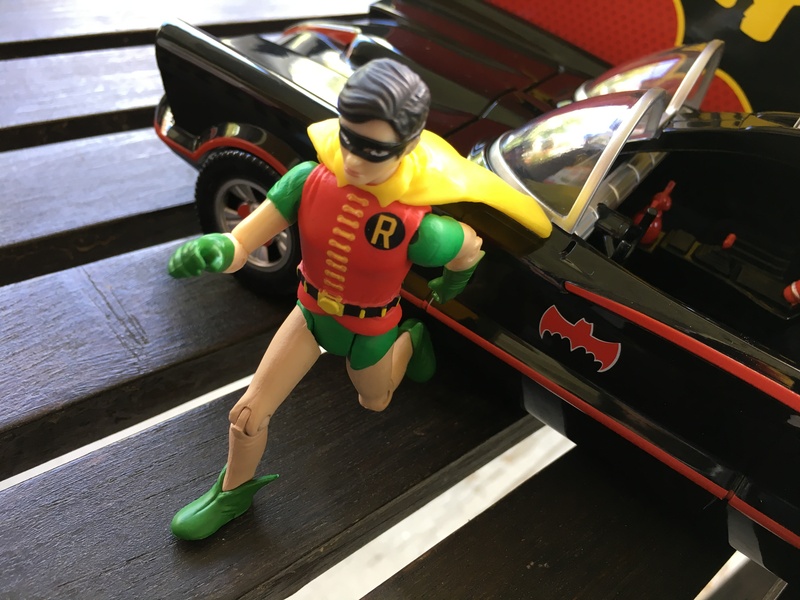 The Good: Sure, his legs could be longer and skinnier but this is 3.75-inch scale we’re talking about, and like the Batmobile, you can’t exactly compare this to a $250 1/6-scale figure. 8. The Quibble: The eyebrows are well-designed but out of scale with the rest of his mask. I’d like to see Funko fix that in future waves. 9. The Great: Robin’s outfit is outstanding. The color, again, is on the money. He also looks like Burt Ward, with his sideswept, brown hair. 10. The Quibble: Though his face strongly resembles Ward, yes, the eyes are set a little too far apart. Again, that’s the definition of a quibble and it doesn’t really bother me. But I’ve seen it mentioned elsewhere, so I figured I’d address it. Overall, he looks great top to toe. 11. The Great: There are nine points of articulation — and the ball joints really work well. 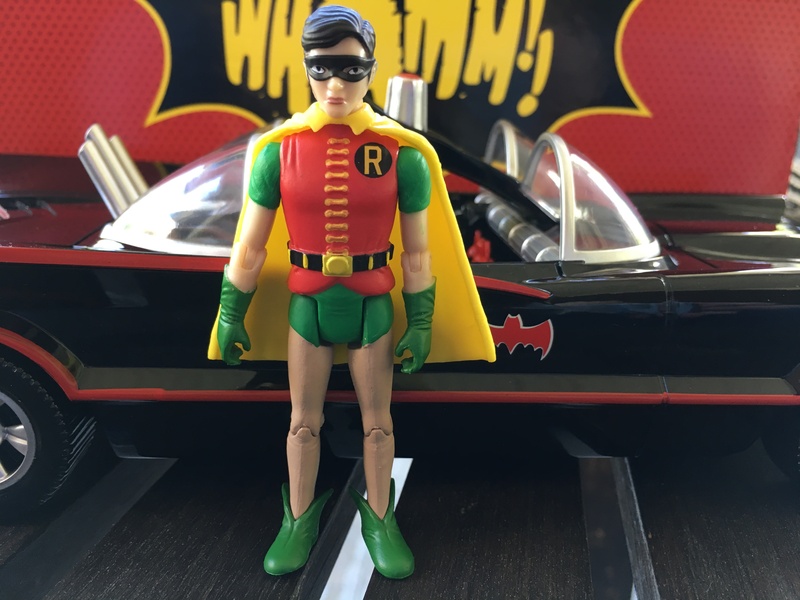 There are Batman ’66 figures out there that are far more expensive that don’t give you this level of playability — another reason Funko has a chance to surpass other action-figure lines. 12. The Good: Ah, the capes. I saw the cloth-caped prototypes at Toy Fair. I see the plastic capes here. The plastic capes are far, far better looking. But it does make it more difficult to get them seated in the Batmobile. But that’s a trade-off I’ll make in a Bat-second. The complete Wave 1 of figures is due in June. Click here for details. 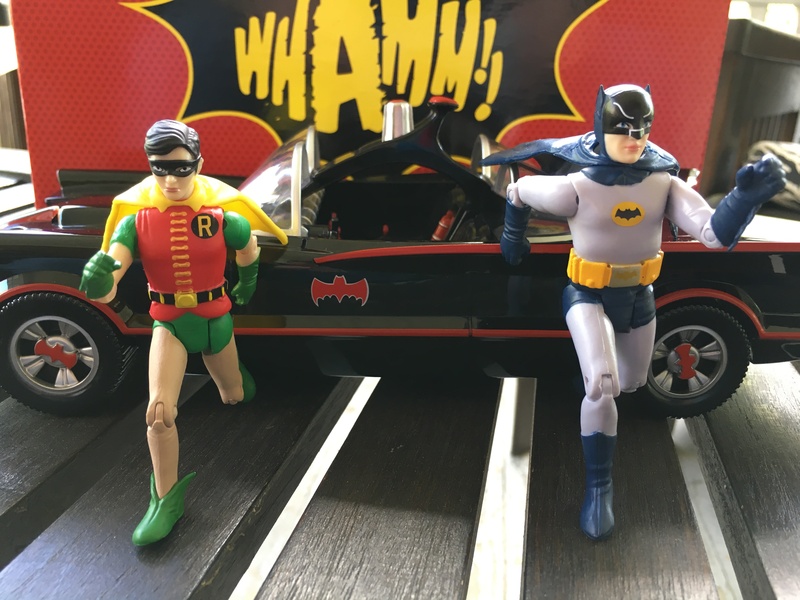 For even more coverage, check out the FUNKO BATMAN ’66 INDEX. Click here! 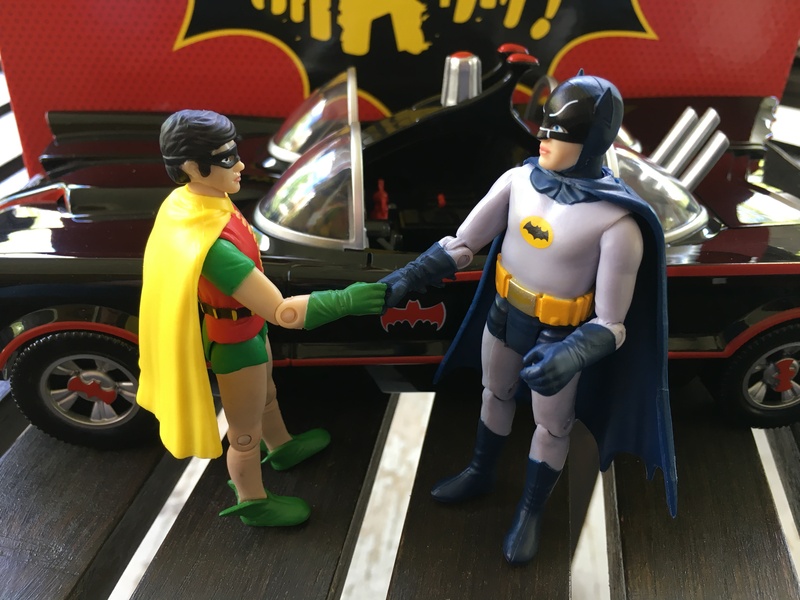 For a great photo gallery of the Batmobile with Batman and Robin, click here. Mine arrived last week and Funko did a great job! I hope Adam got to see these. Personally, I love them. But with both professional figure development background and an absolutely rabid fans mentality I’m going to give these my honest observations. Get ready for nitpicking. The advanced images and box art both show digital illustrations of the figures most likely prepared way before the product was even prototyped. So seeing the real product in person the first time can be a little jarring. That being said, the figures are adorable with good sculpts really nicely straddling the realism vs Toy line. 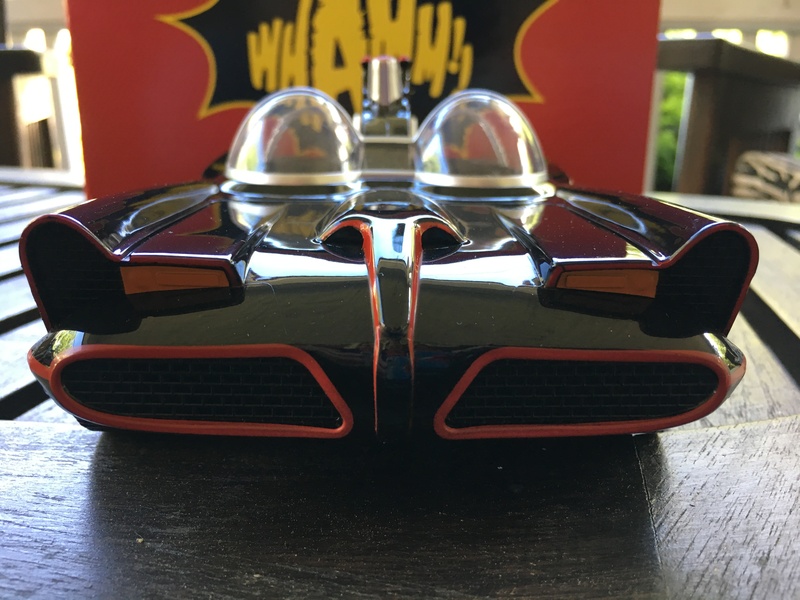 The Adam West Batman has a great likeness and the paint is for the most part clean and precise. It’s also a bit off model with incorrect eyebrows on the mask and other paint design on the head that throws off the sculptural likeness to Adam in costume. The black plate extends way to much into the head, and the mask opening is too far back from the face, giving it that 60’s bubble head attachment look that many of the old tin batmobile figures had. This took me half an hour to fix with paint and makes all the difference. 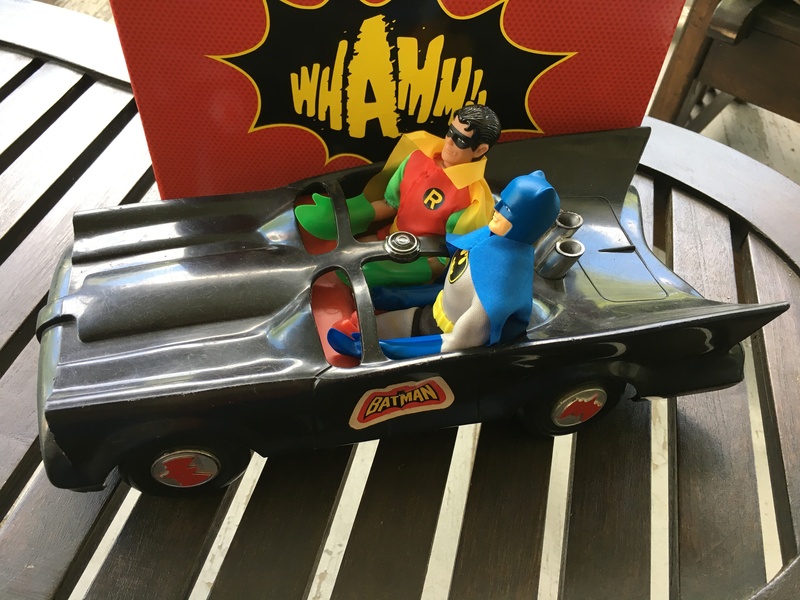 Wrapping this review up with some quick notes; the figures have nice rubber capes that unfortunately hinder them sitting well in the Batmobile. The Adam figure is a little on the stocky side, but both figures have nicely jointed shoulders that really makes them a little less “Stiff”. It would have been great to see this modern element added to the legs, but I applaud Funko for going that extra step of the shoulders. I’ve neglected the car! 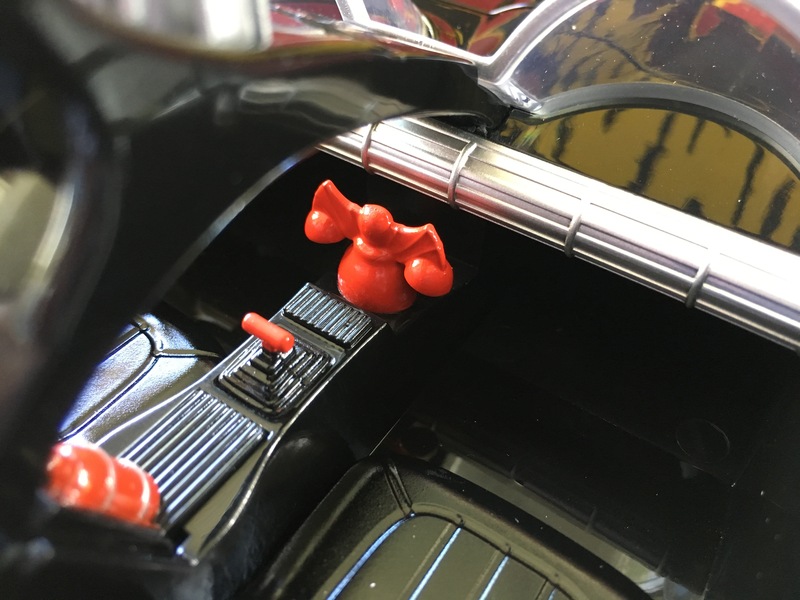 It’s great for a toy with an impressive recreation of the bold lines of that car that we all love so well. As a toy, it’s been shortened for production realities and the back end in particular seems a mite stubby. But no mater your age it’s hard not to loose your dignity, sit on the floor and go zoom zoom with it. The box shows several figures coming. Again they appear to be digital illustrations and not photos of actual product, but based on these first two figures in hand I’m very excited. By the line-up we can assume it’s just the first wave as Joker, Pengy, and Riddler are not shown, but with choices like Book worm, Tut and both 2nd and 3rd incarnations of Mr. Freeze I’m blown away! With obscurities like a Book Worm figure there is a wish list burning up my imagination with Eartha Kitt, Joker as Pagliacci, Catwomans tiger clad thugs, Penguins goons, Gorshin in the suit, Gordon, O’hara, Louie, Joan Collins!, Jeeze, the mind boggles at all the possibilities from this most Revolutionary and colorful TV series. Wave 2? I’m begging for a wave 4! What stores are going to carry these. I have been looking and haven’t seen them anywhere. Prefer to buy at a store than order and have to pay shipping. Plus, always when you buy something in the may others in the house what to know what you bought. None of your business!